Mahamadou Kaba-Camara is a center for California State University, Northridge's men's basketball team. Standing at seven feet tall, he is the tallest player on the team. Photo by Paul Trafecanty. 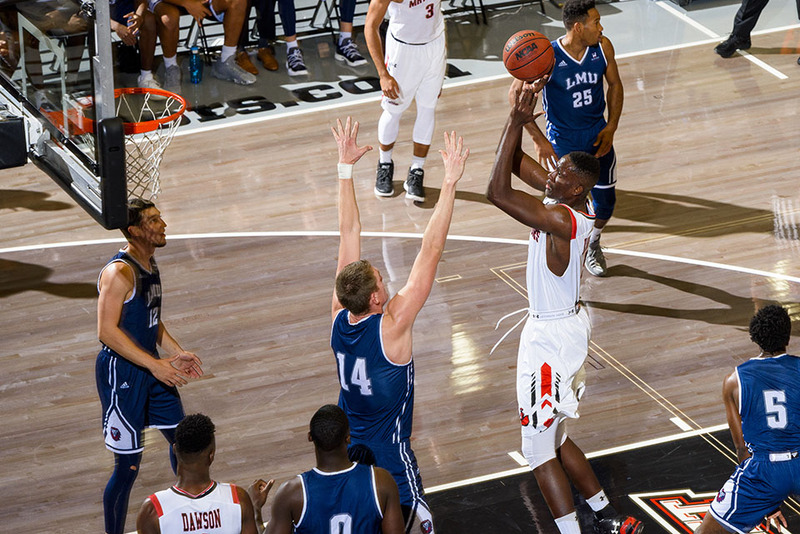 Kaba, as he is known to his friends and family, is a strong presence on and off the court, earning a 3.5 cumulative GPA in his two years at CSUN as a mechanical engineering student. Photo by Paul Trafecanty. On the coast of West Africa, bordering Sierra Leone and Mali, there is a little-known country by the name of Guinea, whose climate is tropical — with dry winters and rainy summers. 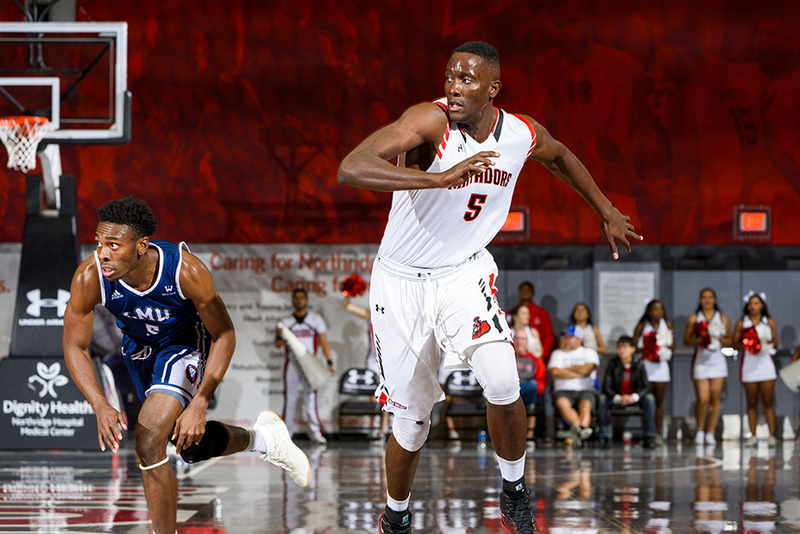 Mahamadou Kaba-Camara, a center for California State University, Northridge’s men’s basketball team, was born and raised there with his parents and eight siblings. At the age of 14, Kaba-Camara was already 6 feet 6 inches tall, towering over his parents and all of his siblings. Despite his height, he did not seriously play basketball growing up. Kaba-Camara lived in Conakry, the capital and largest city of Guinea. His hometown is a port city, making it the center of Guinea’s economy, finance and culture. The infrastructure, he said, is not as developed as in the U.S.
What is now Guinea was occupied by different African tribes until French colonization in the 1890s. After almost 70 years of colonization, Guinea declared its independence from France in 1958. When he was 16, the Guinea native had grown a few inches taller — making him about 6 feet 9 inches — and still played basketball just for fun. But his life changed one day as he was in his hometown of Conakry shooting hoops with his friends. “I met a coach there who, since I am very tall, was very interested in me and he said, ‘You know what, you have an opportunity to go to the United States if you want to go play basketball and keep going to school.’ I was very into that and thankfully, I’m here now,” he said. At 17 years old, Kaba-Camara — known to friends as “Kaba” — left Guinea for the United States, completely alone and not speaking a word of English. The recruiting coach he had met helped him get a scholarship to a boarding school in Ohio, which covered tuition, a meal plan, and room and board. During his time in Ohio, Kaba-Camara lived in Willough, a small city approximately 20 miles southwest of Cleveland. Though he was set up to be comfortable, he still had a rough time transitioning from Guinea to the U.S. for multiple reasons. “First of all, the weather was completely different,” he said. “I’d never experienced winter or snow before. I got to Ohio in the fall and then winter came so it just kept getting colder and colder. Fun fact, I learned that the winter [I got there] was the worst they had had in almost 40 years. It was extremely cold and it was snowing all the time. In addition to the drastic change in climate, Kaba-Camara had a difficult time adjusting to life in the U.S. because of the language barrier. But with time, making friends and being on the basketball team, he learned English and excelled academically, earning offers from several colleges and universities across the U.S.
Three years later and nearly 7,000 miles away from home, now 7 feet tall and 274 lbs., Kaba-Camara is hard to miss. He is the tallest player on CSUN men’s basketball team and barely has to jump to dunk. The mechanical engineering sophomore has a dominant presence on the court and in the classroom, currently holding a 3.5 cumulative GPA. He has received numerous accolades as a student-athlete, including fall and spring 2017 Dean’s List as well as fall and spring 2017 scholar-athlete honors. Kaba-Camara also is set to be honored at this year’s Varsity N Awards ceremony, a recognition dinner for student-athletes having achieved at least a 3.2 GPA over the previous two semesters while playing at least one season of varsity competition at CSUN. Teiana Jones, senior associate athletic director for academic services, said that Kaba-Camara is an especially diligent student. Jones, who works closely with student-athletes, also said that Kaba-Camara is a great example for his teammates and other Matadors who balance academics with sports. In his two years at CSUN, Kaba-Camara said he has had a “great experience,” particularly because of the independence his professors allow him during his educational path. “I like the fact that you need to really take on your own responsibilities in college,” he said. Kaba-Camara has a particular affinity for mathematics, and said that mathematics professor Michael Neubauer, whose calculus 2 course Kaba-Camara was enrolled in, had a great teaching style. “Math in general is a really abstract subject, so you can’t really see what you’re going to do with it, but he was trying to make us see what we could do with everything that we were learning, even if it was really difficult to understand,” Kaba-Camara said. While math is not difficult for Kaba-Camara, being so far away from his family is a different story. The 20-year-old center has not been back to Guinea in three years. He has not seen any of his family members since he first left, which has been very tough for him, he said.